“We hope the residents of Amherst, through the events organized by CANSA, will take the time to learn of our shared history and educate themselves on the important role African-Nova Scotians have played and continue to play in the Town of Amherst. 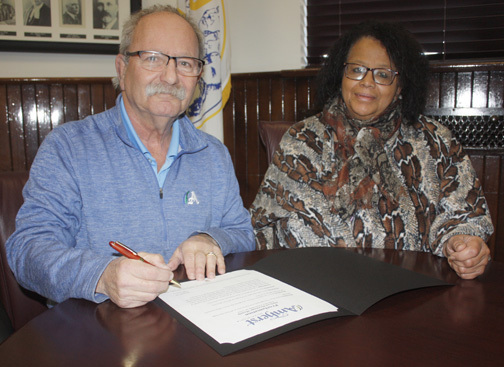 The proclamation was signed in the presence of Elizabeth Cooke-Sumbu, CANSA executive director and a director of the African-Nova Scotia Network. Through this year’s theme, “we’ll be able to demonstrate, through word and a little bit of music, that we have a shared history,” Cooke-Sumbu added. “We wouldn’t be here without everything and everyone that’s been a part of this community. Feb. 1 – African Heritage Month official launch and poster unveiling. Dr. Carson & Marion Murray Community Centre, Springhill, 11:45 a.m. to 1 p.m.